I have found myself extremely nostalgic this year as I approach my 10th year in the Sorority and turning the big 3-0 as well. I evaluated the decisions I’ve made and reflected on the progress I’ve made in my adult life all to find that I have few regrets. I’ve travelled across the country, grown my friendships, and found a career I am passionate about, but the one thing that sticks out to me the most is… my time in TBS has been the longest relationship I have ever had. Dramatic I know – and I’m sure some of you are rolling your eyes like “She’s one of those people,” and yes… I am! But hear me out. They always say that you’ll find love when you least expect it, and just like many of you, a group a friends introduced me to something that would capture my attention and later my heart. The recruitment and rush process is like flirting. You meet some members, learn about the organization, maybe do some sisterhood or service activities alongside active members, and then you start to imagine yourself with them. I saw the immediate opportunities of being a member of TBS by having an outlet to serve, and a place to belong on a growing campus. After going to a few rush events and talking to some of the members, I flirted with the idea that maybe Tau Beta Sigma was the organization I was supposed to join. Your membership process is a time where you learn more about the ideals of the Sorority, grow your relationships with the members of your class and chapter, and learn how to serve your bands. When you are in a budding relationship, you spend more time with your special someone, find out what makes them tick, create memories, and share who you are with them. Your MC process is really one that you start to reflect on your shared interests with the members and how you relate to the ideals of TBS, and you can’t help but imagine your future within the organization. My process was a whirlwind filled with laughs and memories that I will cherish for a lifetime, and with each week I found myself more in love with the future possibilities as a member of Tau Beta Sigma. Friday April 13th, 2007, I (figuratively) updated my Facebook status as I walked across the stage at Southwest District Convention with 13 other ladies into the Bond. I definitely went through the infatuation/new active high phase. In the beginning phases of love, you find yourself noticing the little things and floating on the beauty of the budding relationship you have just committed. Each song fills your heart, and serving alongside your Sisters and Brothers fills your heart with so much joy that you run to shout it from the top of the marching band tower. I purchased loads of TBS swag, volunteered for everything, and dived head first into all things TBS. In my first active semester, our VPM had to leave the university – and I took a leap of faith and ran for her office and was selected to serve as VPM just months after my own initiation. It was kind of like starting a relationship and for some reason you have to make a really large life decision together, (i.e. moving in together/co-parenting a dog) but my chapter saw my potential, and we took the leap together. I had to learn how to be an active really quickly and especially learn how the Sorority worked, but I am proud to say that I recruited and guided 6 of the most dedicated and wonderful women into the Sorority. (Shout out to Megan, Meagan, Katy, Kaitlyn, Brandi, and my best friend Jennifer). So you’ve survived your first year as an active member going gung-ho for 365-ish days…then life begins to happen. The harsh reality about being in an organization like Tau Beta Sigma and even in a relationship is that the infatuation phase ends, you get into a groove, and the fire (at times) is not as hot as it used to be. But like any good relationship, the time you have in the Bond takes work. You never know what will happen or where you will be in life, but you have to learn how to adapt to change, find balance, be present, and remember to find joy in what you are doing (or who you are with). Being burnt out does not mean that it’s completely over, but that you need a little downtime to reflect and recharge. Reflecting on how you felt during your first ritual, or when you sang in the circle alongside your Brothers and Sisters for the first time, and seeing how you’ve grown in the Bond are great starting points. With all the chaos in our lives and demands around us, we also have to find ways to be present and focus on the goals that we have and the activities that we engaged in as well. If you find yourself in a funk then find ways to spice it up! In my second active year, I was not holding an office and felt a little lost and unengaged. So what did I do? I found additional ways to serve, contributed to another committee, and widened my perspective outside of my chapter to become more involved on the district level. The years after I started to spice things up were the best years that I’ve lived, and my horizons were expanded to bring back resources to help my chapter to grow as I did. In the traditional sense, as a relationship progresses, a couple’s lives become more entwined as they move in together, have kids, or get hitched. My time in TBS did not end when I received my diploma in August 2010. I found ways to stay involved with my chapter and am always available to pick up a flag for a color guard clinic during Southwest District Convention, but in 2015 I had the opportunity to further entwine my life with Tau Beta Sigma as a CVA. As a Chapter Visitation Assistant, I was able to share my experience from when I was an active member and solidify my understanding of the ideals of our organization as I assisted each chapter with resolving issues and growing their chapter in size and impact. 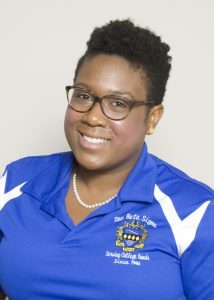 As an active member, our sights are set on growing into being Chapter President or even a district officer, but over the years I have found that my personal desire to grow also meant growing within Tau Beta Sigma as an alumna and Life Member. So, 10 years, three months, and nine days after I became a Sister of Tau Beta Sigma, I had the esteemed honor of being elected as the 2017-2019 National Vice President for Communication and Recognition. Just like a bride to be, I’ve felt excited, overwhelmed, proud, humbled, like an over-planner, prepared, and more in love with this organization and the many Sisters and Brothers within the Bond. I am excited to see where this new level of my relationship with TBS will go as I assist our chapters on the national level! Ten years! Many of us cannot imagine the next 2 years in college let alone 10 years in the Sorority! I never imagined that in 10 years I would be visiting chapters, and sharing my experiences with them to inspire them to press on and grow their influence. The time you have as a member in Tau Beta Sigma will be the relationship that you create it to be. Put forth the effort to see the opportunities that you have as a member, and allow yourself to make this relationship one that will last a lifetime. Previous story The Fall 2017 edition of The Podium is NOW AVAILABLE ONLINE!